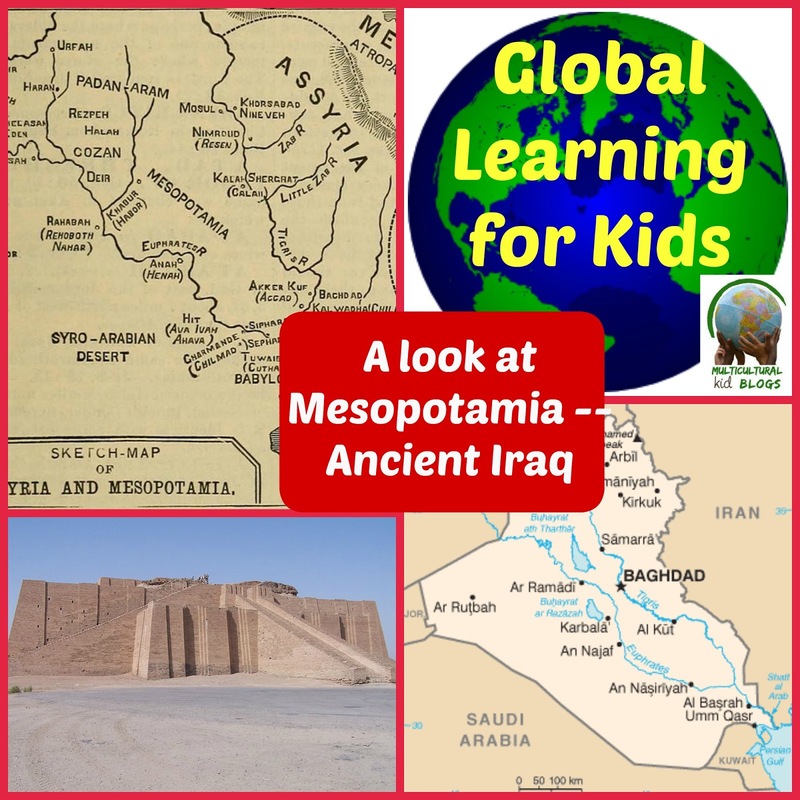 This month we are exploring Iraq with Global Learning for Kids. Last week we shared our look at the Golden Age of Baghdad with books. As we were reading the stories the Bible story of Abraham popped into my head. Perhaps it is because I have told the Godly Play story: The Great Family. And of course looking at the Tigris and Euphrates Rivers and the land inbetween like the story. Then there is the mention of the city of Ur in the books we read as well as in the story. 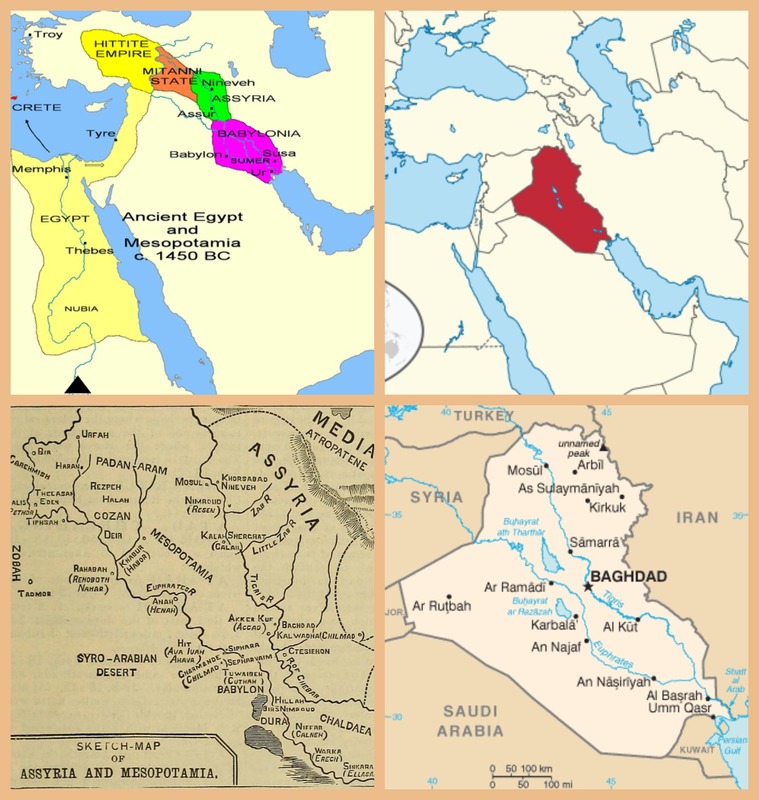 All of these connections made me want to study Mesopotamia a bit more. After all the three major religions trace back their lineage to Abraham. 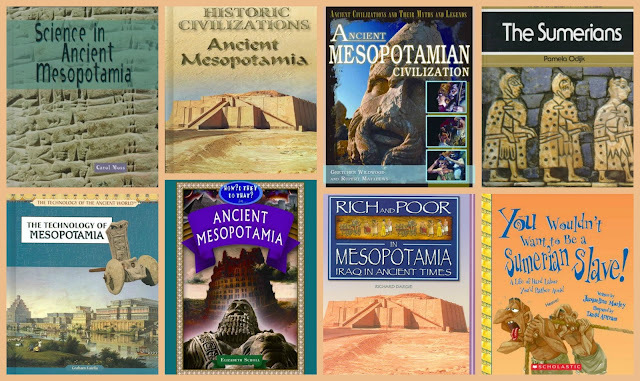 Mesopotamia is Greek for between two rivers and Mesopotamia is this land. It is now mostly Iraq but also some of its is now land in Iran, Turkey and Syria. It is known as the cradle of civilization. However it had many different empires and civilizations lived on this land over the centuries. Some of the empires are the Babylonians, Sumerians, and the Assyrians. From these empires things like the wheel, the chariot and more rose up. Also domesticating animals, sophisticated warfare, and beer came from Mesopotamia. The rivers enabled the settlers to stop being hunters and gatherers and focus on growing their own food and eventually domesticating animals as well. Another thing that is from Mesopotamia our time. Their number system was a base sixty or sexagesimal system. When you think about how many minutes are in an hour or seconds in a minute, you will realize that this timekeeping comes from the sexagesimal system. Another place we see this system is in the measure of 360 degrees in a circle. Over 5000 years ago it is said that Mesopotamians invented writing. (It is also said that writing was invented in Egypt, China, and Mesoamerica.) In Mesopotamia scribes would use a stylus which was a pointed stick or reed to scratch pictures of things on damp clay tablets. This was called a cuneiform. For a longer lasting written document the writing would be on a stone and the stylus would be made of metal or bone. The pictures slowly became abstract and formed into words that represented sounds. Around 2500 BC the sounds were represented in the cuneiform signs. They also had clay envelopes and thus invented stationary. Since clay tablets could easily be changed by wetting the clay they would seal the important documents in clay envelopes and seal them with an official clay seal. We have been exploring Mesopotamia with books from our local library. We haven't read all of them in detail but it has been so interesting to learn about these civilizations!! And some of these are also used for reference in this post! Now since it was a Biblical story that made me want to look into this land and time more I have to share that there are some that believe the Garden of Eden and the Great Flood (Noah's Ark) happened in the lands of Mesopotamia. It has been so interesting to explore this ancient land with so much history and connections to each of us. This post is part of the Global Learning for Kids series for August. Please be sure to check out all of these great posts about Iraq and share any posts you have about Iraq! !